I wonder, did whoever created Valentine’s Day choose to celebrate this day of love smack in the middle of what feels like the longest (despite it actually being the shortest) month of the year to add some pinks and hearts and flowers and cheer, with the intention to help nudge us along into spring? Maybe. It sure doesn’t hurt, does it? Regardless of how it came to be, and aside from the wily ways of consumerism, I am glad Valentine’s Day chose February as a soft spot to land. Admittedly, February is a hard month for my mental health. But cake and flower sprinkles do help. Here in the Midwest you never know what you’re gonna get weather-wise this month, and that can be a tricky thing to bare. There’s either an ice storm or muddy rain or a sunny but frigid sky, and most times they happen all in the same week. Everyone’s sick with something, and then there’s power outages and nothing growing, and on top of it all, we’re still knee deep in winter. Winter ends in April here, some years May, others March. It’s a crap shoot, truth be told. Alas, it’s this time of year that we get a little stir-crazy from being indoors too much, and cabin fever becomes a real thing intertwined with real fevers and lots of runny noses. It’s odd, in February I miss unruly weeds and pesky mosquitos and that one noisy cricket that keeps me up at night, all things I complain about in September. But not in February. It’s time of year that each of us, our pup included, truly miss what it feels like to run through itchy grass and to stay up late watching the stars in the blanket of black above. And also, it’s in February, the longest shortest month, that mindfulness takes a little more patience and a lot more effort. However, I must admit, I am thankful the seasons make me wait. They know far better than I, and I trust their timing. Holding onto this only adds to the well of gratitude I feel swelling as soon as the seasons begin to fold over and start anew. But still, it’s hard. It means doing more things that get me out of my head and working with my hands, a form of everyday mindfulness, and so we’ve been baking almost daily to combat these weary blues. Stella picked out a darling library book last week about how lemonade stands, just doing some summertime dreaming ya know, and it just so happened that it included a recipe for lemon cakes that looked simple enough. 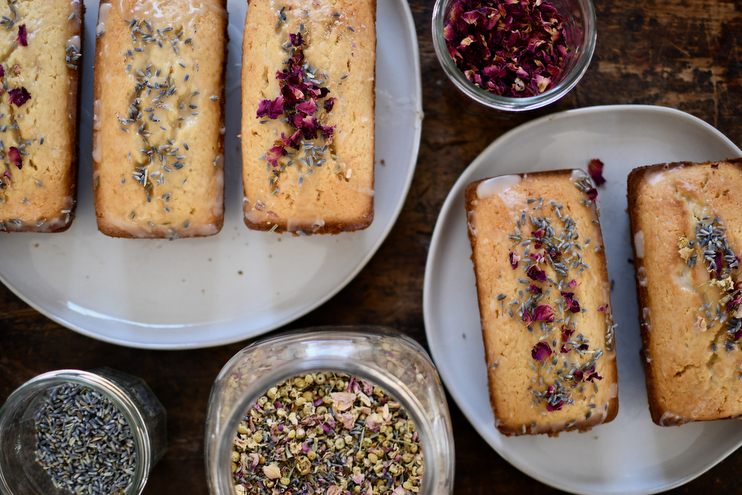 Because we always have flour and lemons on hand, we decided to double the batch with friends, and sprinkle them with dried flowers because why the hell not? February made us do it. We invited our neighbors over that day on a whim to share in our fun. 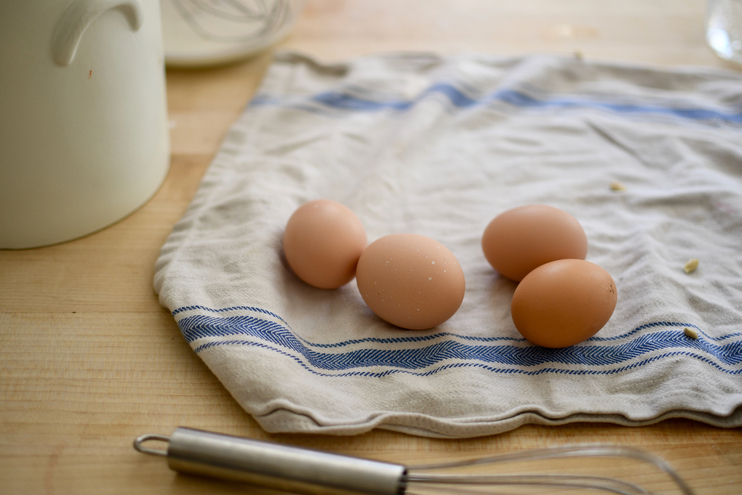 They brought along eggs from their chickens and we spent several hours gathered round the island mixing and measuring and taste testing the batter. Nothing makes an afternoon sunnier than baking with pals. Below is our modified recipe from the book The Lemonade Stand Cookbook by Kathy Strahs, a splendid library pick if I do say so myself! Ps. These cakes don’t have to be made in tiny tins, but it adds to their sweetness, I think. Pps. Bake with your kids. Sure, it’s messy and it takes a long time. But if I had to do one thing a week that helped us all slow down and be present together, baking would be it. It’s a wonderful sensory experience for everyone involved, and the product is usually just as delightful as the process, which is rather nice when it means washing heaps more dishes and sucking flour out of the cracks in the floorboards. 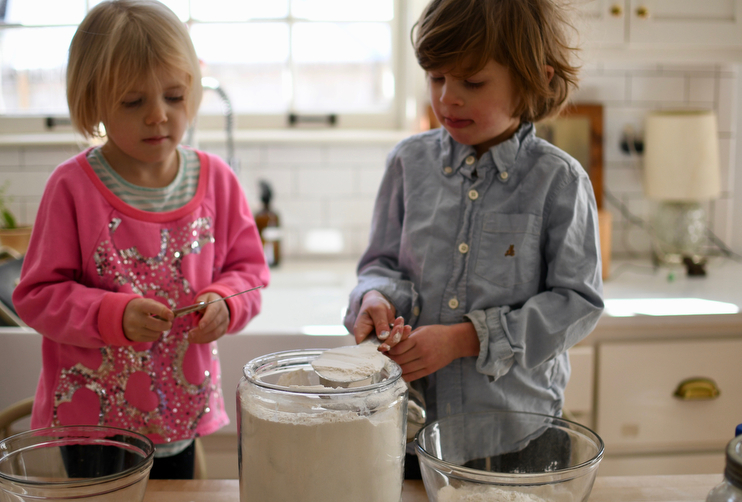 Ingredients for Cakes: We split our group of kiddos in two and therefore doubled this recipe. They worked together taking turns measuring, sifting, stirring, and mixing. Ingredients for Glaze: Just mix together! Dried Flowers: You can source dried edible flowers at most online apothecary shops or local spice stores. Some loose-leaf tea shops also sell medicinal flowers as well. To prepare, heat the oven 350˚ and coat the mini loaf pans with coconut oil to prevent the cakes from sticking. In a medium bowl, whisk together the flour, baking soda, and salt. Set aside. In a smaller bowl, whisk together the milk and lemon juice. The milk will begin to curdle but that’s okay. Set aside. In a large mixing bowl, beat eggs, softened butter, sugar, lemon zest, and vanilla until it’s light and fluffy. Gently mix in 1/2 of dry mixture (flour), followed by all of the wet (milk), followed again by the rest of the dry (flour). Once mixed well, pour batter into the prepared tins and bake for 50-60 minutes, until the center is fully cooked. Allow to cool for 20 minutes before drizzling the glaze and sprinkling with dried flowers. Enjoy with herbal tea with someone you love. And Happy Valentine’s Day!